The next layer is more stitching. The saplings are stitched from the back using heavy thread in the bobbin. 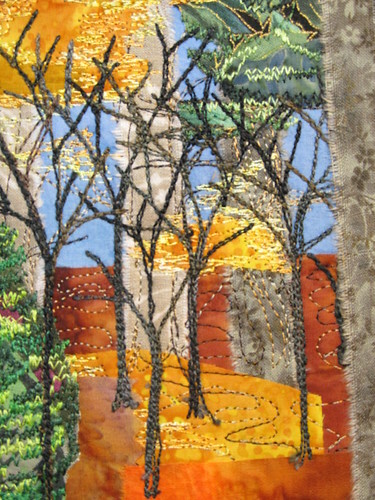 I can see what I'm stitching on the back of the piece, but it is still kind of magical to flip the piece over and find trees. You can see the edges of some more shrubbery (which always makes think of Monty Python) and the bottoms of some pine tree branches. This section is about 3×4" – the whole piece is 12×16"
I broke two needles in three minutes so I stopped. I wear glasses, so I'm less worried about getting stabbed, but it makes me jump every time. My nerves can only take so much!